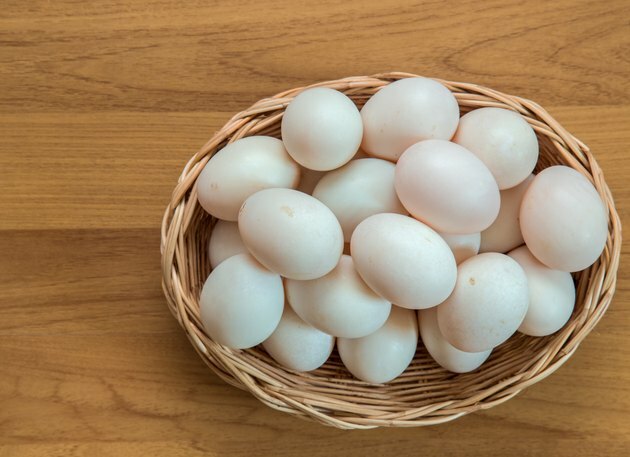 Eggs are one of the most common sources of allergic reactions to food in children. Infants who are allergic to eggs usually experience symptoms soon after consuming eggs or foods that contain eggs. Common symptoms include hives around the mouth or on the body, swelling of the lips and face, and skin rash. Less common symptoms of egg allergy include abdominal pain, coughing, voice hoarseness, wheezing, difficulty breathing and loss of consciousness. An IgE allergy test, which is a blood test that measures levels of a specific antibody in the blood, can detect many cases of egg allergies in infants. Wash off your baby's skin and rinse out his mouth. This may help reduce skin symptoms caused by a contact allergy. Apply hydrocortisone cream directly to any hives or rash to reduce itching and inflammation and help prevent a worsening of symptoms. Give your infant a dose of an oral antihistamine medication. These medications are available over the counter. If your baby's pediatrician has given you a prescription for an oral medication or specific instructions on the type and dose of medication to use, follow those directions. Keep any trace of egg out of your infant's diet. While this is always true if your baby has an egg allergy, it is even more important during or right after an allergic reaction to egg, as continuing exposure can significantly worsen symptoms. Call an ambulance or take your infant to the nearest emergency room if he displays symptoms of anaphylaxis, such as swelling of the face or throat, breathing problems or faintness. If possible, use an epinephrine shot on your infant while waiting for medical help. Prompt use of an epinephrine shot may prevent serious complications or death. If you are breastfeeding, you may need to eliminate all traces of eggs from your diet to prevent a reaction in your baby.